University Programs Courses - Finesse Worldwide, Inc.
Matthew Randall, Center for Professional Excellence. 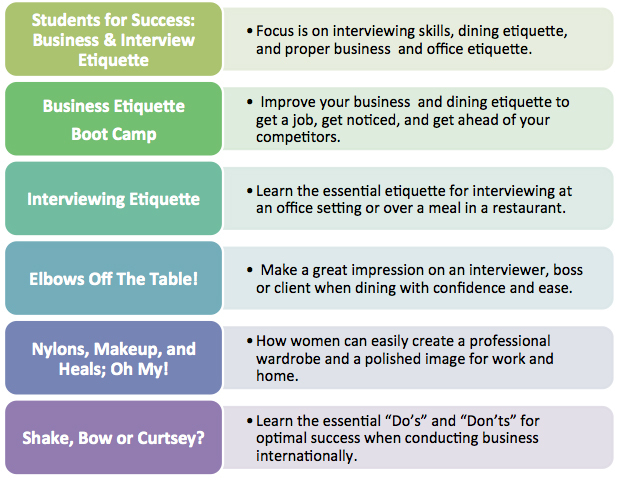 Why Should College Students Receive Etiquette Training? When students augment their college education by learning how to have polished and polite social skills and a professional image, they have an edge over their competitors when interviewing for a job. The Woodrow Wilson National Fellowship Foundation says that “This generation may have many social media friends, but they have trouble communicating in person.” Therefore, college graduates need to learn such things as how to socialize for business, have polite table manners, and proper electronic etiquette especially when working with people older than themselves. Why Should You Offer Etiquette Training to Your Students? We have several programs we can conduct onsite at your school or at an off-site location. Programs range from one hour to a full day session. All sessions may be tailored to meet your needs, time-frame and budget.